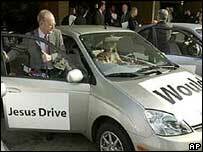 BBC NEWS | UK | Magazine | What would Jesus drive? Church leaders are calling for more action on climate change, but how would Jesus get about if he embarked on his travels today? He spent his life interacting with people on his travels, but if Jesus were alive today he would have more options than just his feet to get out and about to spread the word of God. The environmental impact of travel in the 21st Century has prompted church leaders globally to get involved in the debate on climate change; the Archbishop of Canterbury, Dr Rowan Williams, has changed his car to an environmentally-friendly Honda Civic hybrid. In United States, influential Christian leaders have run a campaign to persuade Americans to tackle climate change. They sponsored adverts in newspapers and on TV urging Christians and the US Government to do more to cut carbon dioxide emissions. Such a debate raises the question of what would Jesus drive if he embarked on his earthly ministry in 21st Century. An eco-friendly hybrid car, a gas-guzzling high-performance motor or would he stick with the greenest and most reliable form of transport on offer - his feet? According to 29 percent of 4,000 UK church leaders asked the question, he would still walk. Their reasoning is that he spent his life talking to people and spreading the word of God, which would not be possible behind the wheel of a car. Of those who said he would choose to drive, 17 percent thought his chosen vehicle would be a camper van. "He would probably brew up and tell stories whenever he stopped in a lay-by, often picking up listeners, " says Rev Andy Jowitt of Milton Keynes. Just behind, with 16 percent, was an electric bus. "It's eco-friendly," said Dr Roger Williams of Hampton Hill, Middlesex. "There would be room for the disciples, converts, enquirers and Christian publications. There could even be a prayer area." 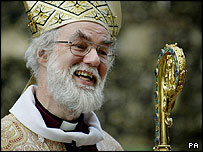 The Rev Clive Jones, of Staplehurst in Kent, says Jesus would opt for a car "despised and rejected of men - a Skoda". Rev Carol Murray of Haddenham, Buckinghamshire, was one of the seven percent who agreed. "Jesus would use an ordinary family car to identify with humanity and not stand out." The celebrity fuel-efficient car of choice, the Toyota Prius, only got five percent of the vote and clearly out of divine favour is the Porsche Cayenne Turbo, with just one percent. The poll was conducted by Congregational and General Insurance for the National Christian Resources Exhibition, which is held in Esher, Surrey, this week. Car makers will be among the exhibitors. "We all have a part to play in caring for our environment," says exhibition spokeswoman Joy Gilmour. "Some Christians try to reflect this when choosing their means of transport. It is our children's children who will suffer from poor choices we make today." I think we should take the words of wisdom from a modern-day idol. Robbie Williams has a song called "Jesus in a Camper Van". If he could turn water into wine, couldn't he turn CO2 into oxygen? Then it wouldn't matter what he drove. He'd probably make millions (for charity, of course) out of the Jesus catalytic converter, and solve global warming in the process. Surely as a carpenter, Jesus would drive a white van whilst going about his business? Surely Jesus would go by train? Environmentally friendly and a great way for him to meet people. I imagine Christ leading a platoon of disciples and followers on a bike. When the US campaign started, I distinctly remember reading my bible thoroughly and coming to the conclusion that Jesus must have driven a Honda. "For I did not speak of my own Accord..." - John 12:49, and, though I don't have the verse to hand, I think it says something like: "...and when they had finished praying, Jesus and his disciples all left in one Accord..."
I don't know what Jesus would drive, but I do know what Moses would choose. The Bible says that he came down Mount Sinai in his Triumph. I don't think Jesus would drive anything. As the "fat man walking" said recently, walking across the country, he found that people were much more likely to open up to you and chat. If Jesus was in a car, it would more that likely be as a lift from some rich person who wanted His attention. Mind you, if enough people listened to Him, He would probably not need to travel anymore, but have His own TV show. The Archbishop ought to study his maths and physics a little better. The majority of pollution from a car comes from its construction not its use. By ditching yet another car into the ecological scrap heap he does nothing for the environment. We need to stop building them first.